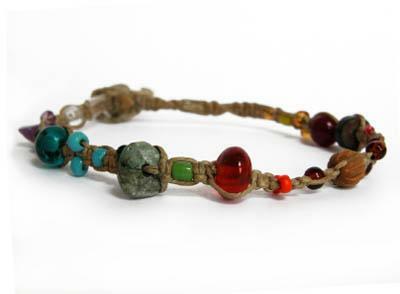 Making hemp jewelry is a fun and easy way to create a one-of-a-kind fashion accessory. Hemp jewelry is a perennial favorite of teens and young adults, but learning how to make necklaces and bracelets from hemp is a great skill for any crafter interested in the art of jewelry making. For the novice crafter, making hemp jewelry provides an inexpensive alternative to other jewelry making techniques. A hemp necklace or bracelet is much more affordable than one made from leather, sterling silver, or semi-precious stones. When you're working with hemp, you can feel free to explore your creativity without worrying about the high cost of materials. Hemp jewelry is also surprisingly durable. This makes a hemp necklace or bracelet perfect for everyday casual wear. Hemp jewelry is meant to be seen and enjoyed, not stashed in your jewelry box while you wait for a "special" occasion. Typically, hemp jewelry is made from 1 mm or 20 lb. twine. However, experimenting with thicker twine can create very appealing projects as well. Most of the twine used for hemp jewelry is a natural tan color, but dyed hemp is also available. While the simplest forms of hemp jewelry are merely made from elaborately knotted twine, adding beads or charms to your project is a great way to create jewelry that perfectly matches your outfit. Lampwork beads, also known as handmade glass beads, are particularly well-suited to hemp jewelry since their colors and styles nicely complement the subtle texture of the twine. Hemp Beadery sells hemp twine and cord, as well as beads, charms and connectors. Hemp Craft sells handmade hemp jewelry and supplies for making your own hemp jewelry. Hemp Basics sells hemp cord and a wide variety of hemp jewelry beads. Although there are many different types of hemp jewelry designs, most jewelry uses simple macramé techniques. You may associate macramé with plant holders and wall hangings from the 1960s and 1970s, but the term really just refers to the practice of creating an item by using a number of different decorative knots. The square knot and the double half hitch are two of the most popular macramé knots used to create hemp jewelry designs.If you have very sensitive skin, or you simply dislike the "scratchy" feel of hemp jewelry, try briefly soaking your twine in water before beginning your project. By allowing the fibers of the twine to slowly merge together, you'll create a smoother texture for your hemp. The easiest way to finish a hemp bracelet or necklace is to tie the ends together, but more experienced crafters may wish to attach a metal clasp to the piece. A clasp is particularly useful if you are making a gift for someone else and you want them to be able to adjust the length. You can attach the clasp by crimping the coils closed.